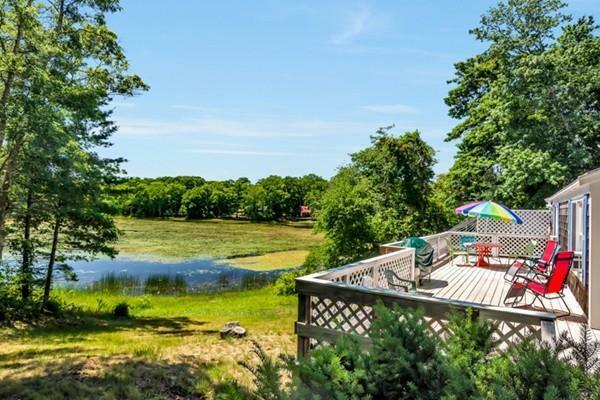 Don't miss this great waterfront home that is quick 15 mins to downtown Plymouth but feel like a world away. Large deck to relax and enjoy the pond views. Kayak right from your backyard. This fabulous house on Little Micajah and the sandy, warm water beach at Big Micajah is only a few houses away. Beautiful updates make this property unique. Open and spacious living room 20x12 with high ceiling is welcomes you with natural light flowing through. French doors lead from the living room into the dining room that has beautiful views of the water. The kitchen is open to dining area 24x10 - great entertaining. The master bedroom also has water views so that you instantly feel like you are on vacation. A second bedroom is a nice size currently set up with two beds. Wood floors and cabinets are just some of the nice features of this vacation or year round home. The lower level has room for expansion with a full door and window.